As I'm trying to reign in the makeup "collecting," I'm starting a new series on my blog called Shopping My Stash. I've seen these circulate on YouTube and other beauty blogs, and I think it's a great way to rediscover an older item in your makeup collection and put it to good use. 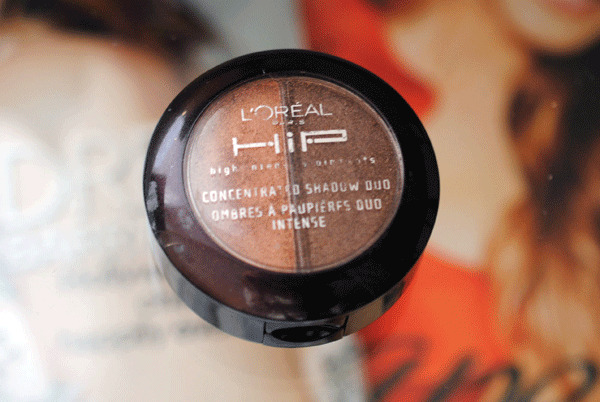 As I've been on a copper eyeshadow kick lately, I checked out some of the oldest eyeshadows in my collection, the L'Oréal HiP Studio Secrets Duos (retail $8.25). I have about six of these duos lying around. Most of the shades I have are now discontinued, but I found one duo that has a current dupe still in the HiP Studio Secrets collection. See pictures and swatches below, as well as some fun GIFs of the eyeshadows in action! 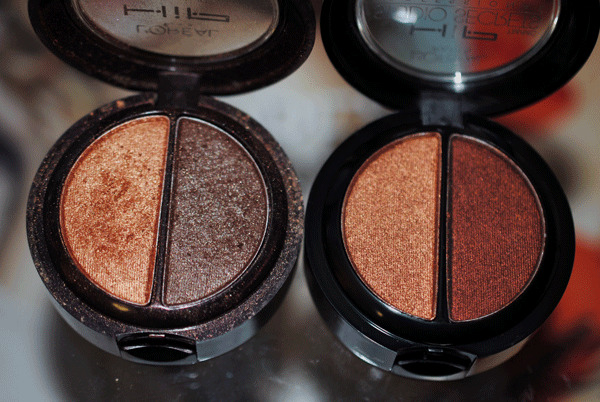 The lighter shade in the now-discontinued Sultry is almost an exact dupe to its counterpart in Charged. The darker shades are very different, with Charged's darker shade being a duo-chrome with lots of black in it. It swatches rusty but applies on the lids much darker. What I loved and still love about the L'Oréal HiP Studio Secrets shadows is that they're incredibly pigmented, apply evenly, have barely any fallout and barely crease on the lids. Now that L'Oréal has had the Infallible eyeshadow range for a couple of years, I don't know if the L'Oréal HiP Studio Secrets line is going to go away. 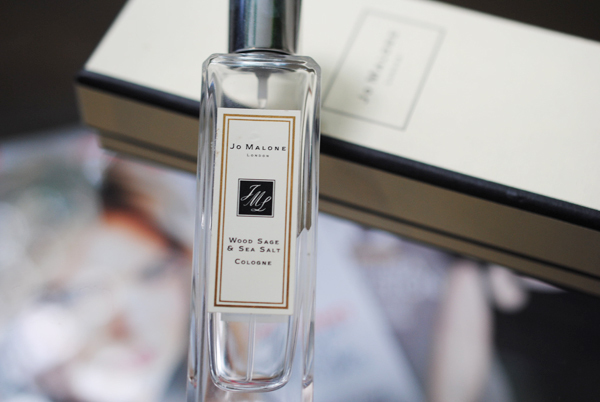 It is still featured on L'Oréal's website, with six shades available. of Saucy's darker shade in the crease. bit of liquid black eyeliner and flicked it out for a slight cat eye. Then I coated on more mascara! 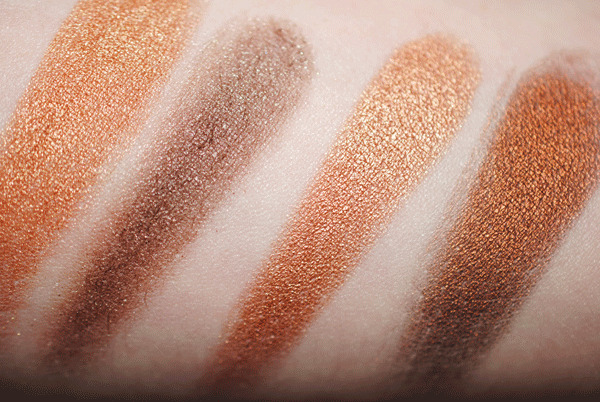 What's your favorite copper eyeshadow? Do you still own and use any of the L'Oréal HiP Studio Secrets line? The L'Oréal HiP Studio Secrets Duos are not paraben-free. Ah! I love your animated pictures! So cool. These shadows look gorgeous on you, doll! Thanks Brianna :) I thought I'd try out the GIFs after seeing them on Vivianna Does Makeup! wow these are stunning! I better stock up if there's a chance that these might be going away! And can I say, YOU ARE GORGEOUS! I mean, just, WOW! That eye look you're rocking in the last pictures is just amazing!